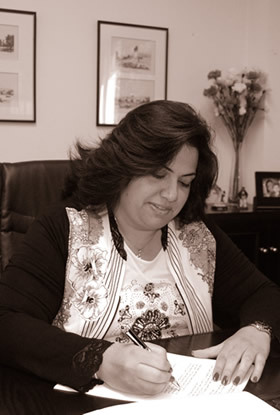 Carole Baroudy is a member of the Beirut Bar Association since 2003 and has joined the Firm in 2009. Carole specializes in corporate, commercial and business criminal law, as well as insurance and maritime law, Intellectual Property and international law matters. Prior to joining the firm, Carole worked for seven years, mainly on criminal and commercial law cases, in another Lebanese Law Firm. Carole is also a member of the Association of Attenders and Alumni of The Hague Academy of International Law, an ex-member of the Beirut Bar Association’s Committee for Child & Youth Protection and an ex-observing member of the International Chamber of Commerce of Lebanon as well. Carole has a Bachelor of Law from La Sagesse University (Beirut) where she also obtained a D.E.A. in Private Law –Major: Finance, in 2001. In 2003, Carole got a Certificate on International Private Law from The Hague Academy of International Law, Netherlands. She’s also studied Legal English at the Girton College, Cambridge University, UK. Carole is fluent in Arabic, French & English and has a limited working knowledge of Spanish.